Another beautiful day in Tampa Bay folks! Days like this, make me wish that I was out fishing the waters of Tampa Bay! People that know me well, know that I am an avid lady angler (known to catch fish more than all of my exes) who would give up just about anything to trade my role as Social Media Queen for salty waters and a fishing pole. Since I have been so slammed gearing up for the upcoming IIFA Celebrations, I reached out to Capt. John Paiva with Tampa Bays Fishing Charter to help me out. Lucky for you, he&apos;s going to “hook” you up with a few fishing updates! Water temperatures are in the mid 70′s and it’s the peak of the spring fishing season. The fishing in Tampa Bay just does not get any better than it is right now! 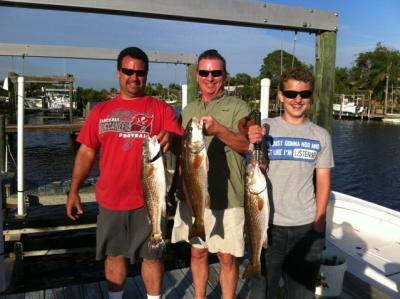 My clients have experienced tremendous fishing charters in the past two weeks. We have averaged days of 15 – 20 snook (all released), nonstop Redfish action, great Mackerel fishing, and of course we are catching trout, Black Sea Bass, and some feisty large Jack Crevalle. As I said earlier … the fishing is on fire! The rest of April should continue to produce great Redfish and Snook action. Cobia will be roaming the flats and following stingrays. They will also frequent the local channel markers and any major structure though out Tampa Bay and offshore. These Brown bombers are one of the strongest species to fight on lighter tackle and they are very good eating when caught in open water. Tarpon fishing will also heat up from now through the end of July. It’s not uncommon to hook up on a 120 lb. Tarpon while fishing for Trout or Mackerel on the flats. It’s one of the greatest thrills for the client and me to see a huge Tarpon smoke off 150 yards of line and jump completely out of the water. How exciting! Pro tip: Weekends are very busy times on the water for fishing in Tampa Bay – particularly when the weather is so nice and everyone wants to get out and catch some fish. So, practice the proper etiquette on the water… don’t buzz around the edges of mangroves and shorelines other anglers in the area intend to fish. If there is another boat in the spot you want to fish — too bad! Find another spot – - – It’s a great time to move somewhere else and find your own “new fishing hole”. I have often found new spots by trying a new location (because someone was in a spot I wanted to fish). * Go where the wind is at your back and the water flow shows promise of predatory game fish. So, enjoy your day on the water and remember the “golden rule”. Well, that’s all for now. I hope you can get out there and wet a line soon. Remember, “If your too busy to go fishing – you’re just too busy!” Be safe and enjoy a beautiful day on Tampa Bay!